We spotted this gorgeous collection of DIY flat-pack lamps by the Danish company Vita at 100% Design during this year’s London Design Festival. Interchangeable “petals” made from polypropylene, polycarbonate and even goose feathers are easily assembled around inner illuminated frames, creating soft glowing lamps that mimic the overlapping scales natural forms like artichokes and pine cones. 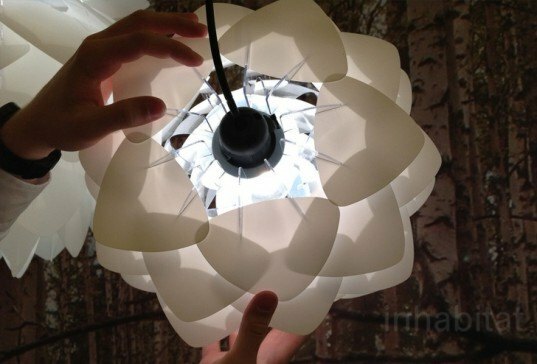 Vita promises that you can transform their box of parts into a lamp parts in just 10 to 20 minutes. See how it’s done after the jump! Vita‘s flat-pack lamps feature a simple construction based on a set of slotted vertical frame pieces that allow “petals” to slide in concentrically around the light source. We love that there are no fasteners, or adhesives holding the lamp together, and the design is based on the characteristics of the raw materials. The other wonderful thing about the assembly is that is can be taken apart or altered with another set of colored, patterned, or even differently shaped petals. As an alternative to the classic white sets, Vita has released many accessory sets to update your lamp with black or even paisley yellow petals. The collection now contains more than 10 styles and a wide range of colors. Vita lamps are available at stores in more than 20 countries, or through their website. We spotted this gorgeous collection of DIY flat-pack lamps by the Danish company Vita at 100% Design during this year's London Design Festival. 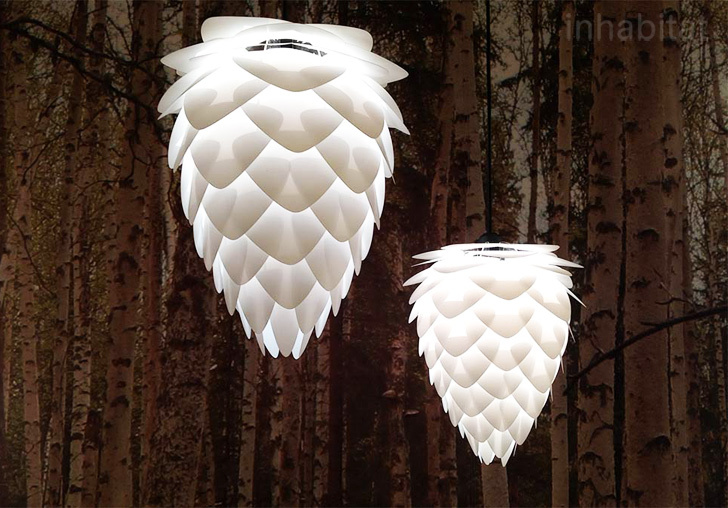 Interchangeable "petals" made from polypropylene, polycarbonate and even goose feathers are easily assembled around inner illuminated frames, creating soft glowing lamps that mimic the overlapping scales natural forms like artichokes and pine cones. Vita promises that you can transform their box of parts into a lamp parts in just 10 to 20 minutes. See how it's done after the jump!